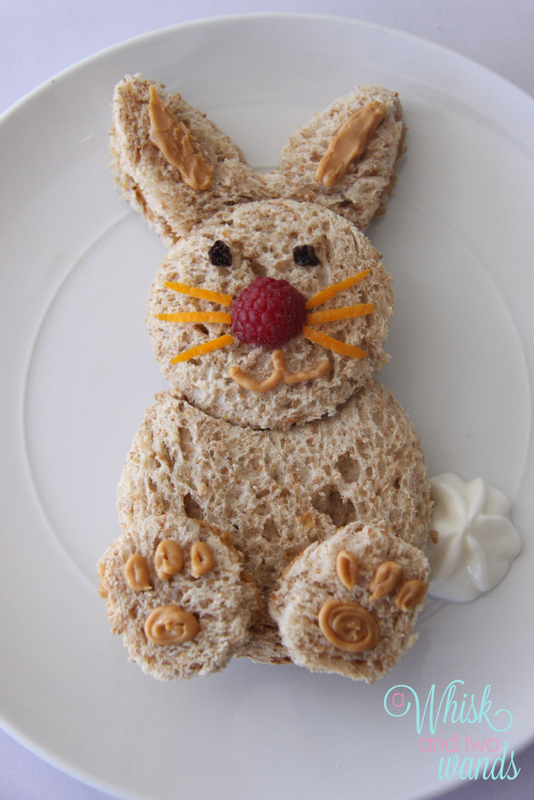 So my daughter came to me and asked can I have a bunny sandwich today. I said sure and asked what should it look like. To which she drew me a picture. I said ok go wash your hands and get your stool we will make a bunny sandwich. While she ran and washed her hands I grabbed some supplies. I figured out how to get the shape of the bunny she drew and she helped cut out the pieces. Than the fun part her picking out what to use to decorate it. Yes this will take longer to make then making a regular peanut butter sandwich but think of it as more than that. It is spending time with your child and creating memories. We don’t make sandwiches like this everyday but when they ask I try my best to make the time and we have “art time in the kitchen”. Sometimes I am feeling inspired by something and I will surprise them and when I see their faces smile and light up it make it all worth the extra few minutes. They will only be little once and they grow up too quick so I take every chance I get since I don’t think they will want animal sandwiches in high school. First we made 2 peanut butter sandwiches. Than we took one of the sandwiches and set the 3” cutter on the bread and then lined up where the 2 ½ ” would go so it was overlapping the 3” so we knew where to place it to get both out of the bread. Once we made sure both would fit on the bread we LIGHTLY pressed the 3” to leave a slight indent and removed the 3” and cut out our 2 ½” circle. After that we went back and cut out our 3” circle using the indents as our guide. These two will now line up so you have a head and a body using all but the crust of one sandwich. Using a kitchen scissors or knife cut out the ears, you can have the bottom of the set of ears flat and then use the edge of the 2 ½” cutter to make a slight circle in them to line up on the head. Next you will need to cut out one smaller circle for the feet and then you separate your small circle using 1 slice of bread for the foot, the peanut butter on the back will act as your “glue” to attach it to the bunny. You should now have an assembled bunny! Now the fun part, the details! I piped peanut butter on the ears and feet for detail. A decided she wanted to use currants for eyes as she thought that raisins were too big. She picked a raspberry for the nose and wanted orange zest whiskers. Then she said “we need a puffy tail!” so we used yogurt in frosting bag with a large star tip and she piped the tail next to the bunny. I say we had another successful day of art in the kitchen! Not only do I enjoy making these creations with my girls but watching them eating them is such a hoot too! First she ate his nose and giggled. You know bunnies like carrots! 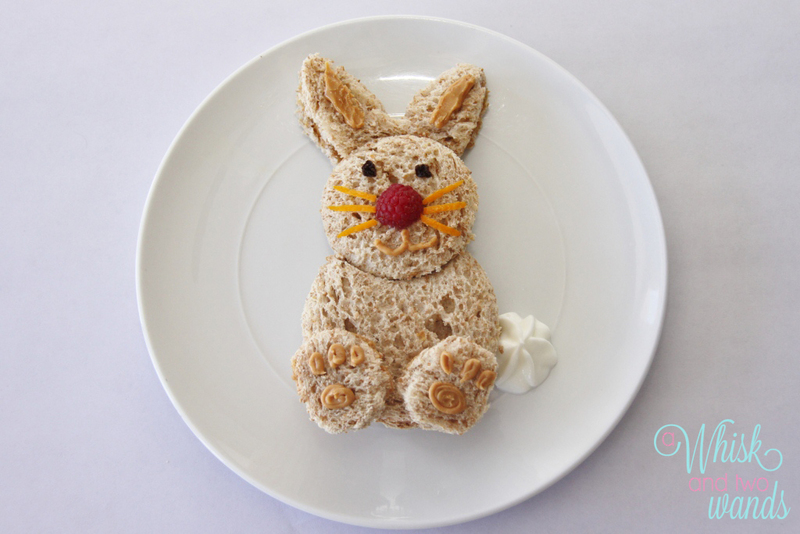 Check out these Strawberry Yogurt Carrots which would go great alongside this cute bunny!